The outbreak of World War II in the autumn of 1939 disrupted football across the entire country, and Abbey United were not immune to the stoppages. In order to prevent the ground being requisitioned for military use, the club had to prove that matches were being played regularly, and the Secretary, Frank Pettit, arranged friendly matches with local RAF and Army camps. A Cambridgeshire Emergency League was set up and Abbey United also entered the Cottenham and Willingham Nursing Cups. Results of these matches were largely irrelevant and teams often contained guest players. Two stars of the time, Dixie Dean of Everton and Alex James of Arsenal, were among those who appeared at the Abbey as guests of visiting teams. In a match at Milton Road against Cambridge Town, who had also kept their ground open, the Abbey recorded their first win over their rivals, running out 7-2 winners. The press was able to publish few details of these matches, for the Government didn’t want the enemy to know about the large number of RAF stations in East Anglia; restrictions were even put on the publication of players’ names. The strictures of war began to take their toll on the club’s finances and the War Ground Tax exacted a heavy toll; the club was becoming poorer the longer the war continued. By 1944 the situation was critical. Then Herbie Spicer, a railway engine driver from Ditton Fields, came up with an idea that would make or break the club. He asked Frank Pettit to scrape together all the money the club had, and with that money (£38) Pettit hired a band and the Beaconsfield Hall in Gwydir Street, and held a dance. The idea worked, £80 was made on the night and the club were saved. By the 1945/46 season organised football was beginning to make a comeback and Abbey rejoined the Cambridgeshire League, which consisted of just two regionalised divisions. United finished fourth in the eight-team Division A. In the FA Cup they were drawn at home to Cambridge Town but again the more senior club recorded a decisive victory, this time by 8-0. With Histon Institute also recording heavy victories over the Abbey – 7-0 in the East Anglian Cup and 6-1 in the Creake Charity Shield – it was not a happy return to competitive football. The 1946/47 season came and went in similar fashion, United again finishing fourth in the Cambs League Premier Division. They did, however, reach the final of the Cambs Challenge Cup, in which they were defeated by Camden United. By the summer of 1947 the club had moved into new headquarters at the Ancient Druids pub in Fitzroy Street, and it was here that an unofficial and tentative invitation to join the United Counties League was received. A formal invitation had been made to Cambridge Town, which had turned it down. The UCL was made up of professional and semi-professional players, but the committee decided to take up the invitation while remaining amateur. Some members of the UCL committee who had never heard of Abbey United enquired jokingly whether the team was made up of monks, but when it was pointed out that the club had an enclosed ground at which it could charge gate money, the league decided to accept its application. A crowd of over 1,000 turned up to watch Abbey United’s first UCL match at home to Rushden Town on Saturday, 23 August 1947. J Gaunt had the honour of scoring the Abbey’s first goal at the higher level but the visitors ran out 2-1 winners. Club officials were happy, though: they took more in gate money for this one match than they had in the entire previous season. Crowds of over 1,000 were commonplace and more than 2,000 turned up for a match against Wisbech Town on 18 October 1947. On 2 October 1947, at a meeting in the Corner House pub on Newmarket Road, it was decided to form the Abbey United Supporters' Club, and Harry Habbin was elected President. A move designed to harness the growing support, it was to have a big effect on the club's development. Banking behind the goal at the Newmarket Road end of the ground was built in December 1947 and, with attendances rising steeply, the club were able to pay for taxis to pick players up from work and take them to away matches. The first season at the higher level finished with the club third from bottom while managing to win 10 and draw four of their 34 matches. Histon Institute knocked United out of the FA Cup by with a 6-4 victory in the Preliminary Round, but the Abbey fared better in the FA Amateur Cup, in which wins against Ely City, St Ives, St Neots and Achilles set up a First Round Proper meeting with Cambridge Town. Over 5,000 squeezed into the Abbey Stadium but, despite putting on a brave display, United went down 1-0. More ground improvements were made in the summer of 1948 in preparation for a season that was the first in which Abbey United played matches with two neutral linesmen appointed by the FA. Previously, each club had to provide a linesman. More than 2,500 watched an FA Cup Preliminary Round match against Wisbech Town that ended in a 1-1 draw. An amazing replay at Wisbech, attended by more than 3,500 spectators, was all square at 0-0 at half-time, but Wisbech scored eight without reply in the second half. The league season showed improvement on the previous season with United finishing in 12th place, winning 14 matches and scoring an amazing 101 goals. Sixty-three of them were notched by the strike partnership of Russell Crane (with 43) and Albert George (20). On 16 May 1949, at a General Meeting at Brunswick School, it was decided to form a limited company to provide funds to purchase the freehold of the ground and to provide ‘better football in Cambridge’; this despite the misgivings of RJ Wadsworth, who felt that, as the ground had been left in trust, it should remain so. The freehold had been offered to the Club at £700 and guarantees of up £1,000 had been received. A limited company with shares valued at £10 or ten shillings was set up and the club decided to turn professional. 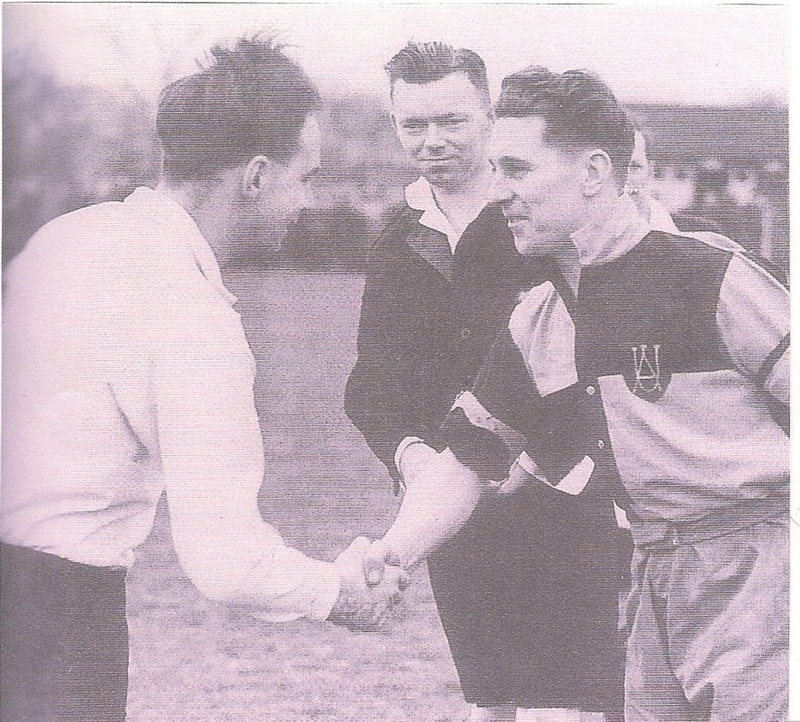 Abbey United captain Joe Richardson (right) greets the Cambridge Town skipper before an FA Amateur Cup match in front of a record crowd of 5,000 on 17 January 1948. Town won the tie 1-0. 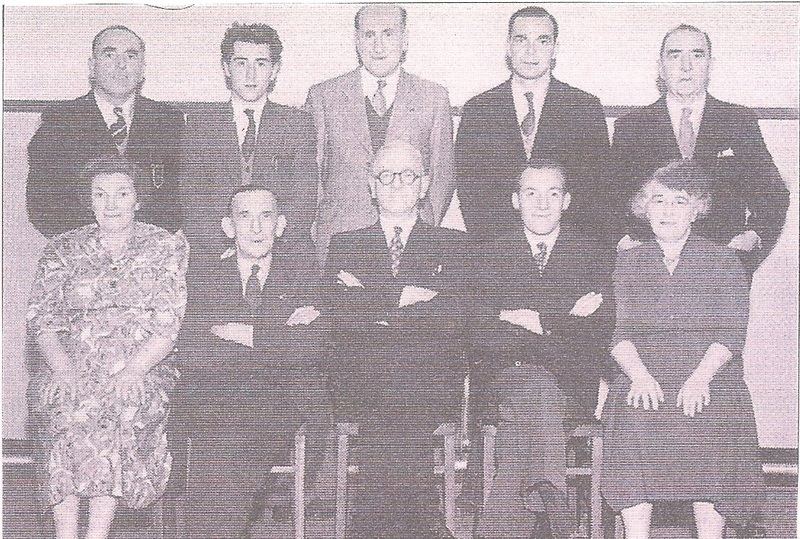 The management commitee of Abbey United Supporters' Club, established in September 1947. The club's first President, Harry Habbin, is in the centre of the front row. 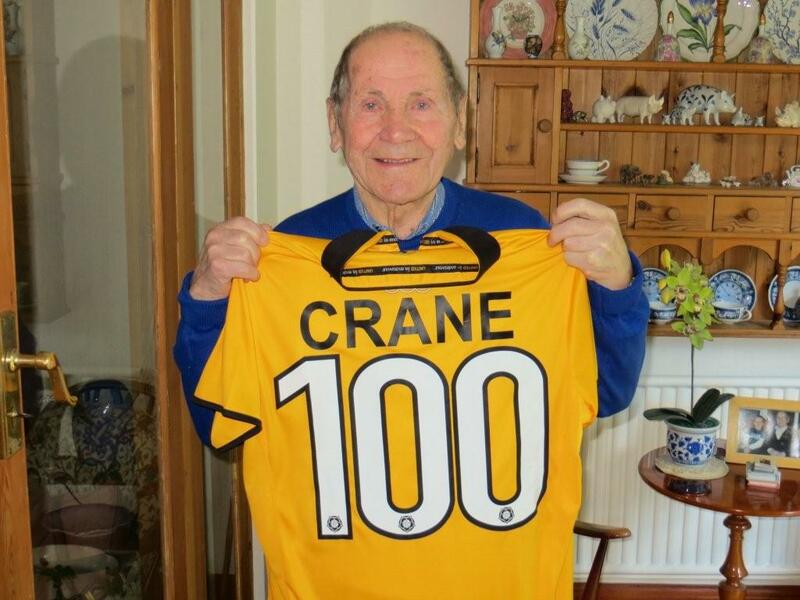 The legendary Russell Crane was the only player to play for Abbey in four different leagues: Cambridgeshire, United Counties, Eastern Counties and Southern. He first came to the club’s notice at the age of 15 in 1941 when the club organised a series of friendly matches against various service teams. Russell played in three positions – outside right, inside right and centre forward – but, because of his tender age he was used sparingly, playing in alternate matches. Still, he managed to compete against some of the top stars of the time, including Scottish international Alex James and ‘60 goals in a season’ Dixie Dean of Everton. Russell joined the Navy in 1943 and could only play when on leave, but his return to Cambridge in 1947 coincided with Abbey United joining the United Counties League. By now he was an out-and-out centre forward, and he finished the first four seasons of UCL football as the club’s leading scorer, chalking up 43 league goals in the 1948/49 season. In one four-game spell he scored an incredible 11 goals, and he was the first United player to score five hat-tricks in one season. Russell’s strong but stocky build, combined with a powerful shot, earned him the nickname of the Human Dynamo. It’s said he broke an opposing player’s hand when the defender tried to stop one of Russell’s shots. After four seasons in the United Counties League, United joined the Eastern Counties League and appointed their first full-time manager, Bill Whittaker. Converted by Whittaker into an attacking left half, Russell found the transformation easy and playing in front of the meanest defence in the league gave him the chance to become the playmaker with quick one-two passes, turning defence into attack fast and decisively. Russell’s last match for United, in October 1958, ended a 17-year career that included more than 300 matches and 200 goals. In 1956 more than 1,500 turned out to watch his benefit match, in which Russell Crane’s XI draw 2-2 with a Combined XI. Over the years Russell turned down chances to play for Ipswich Town and Peterborough United, preferring to stay with his beloved Abbey/Cambridge United. See our interview with Russell Crane on Coconuts TV. 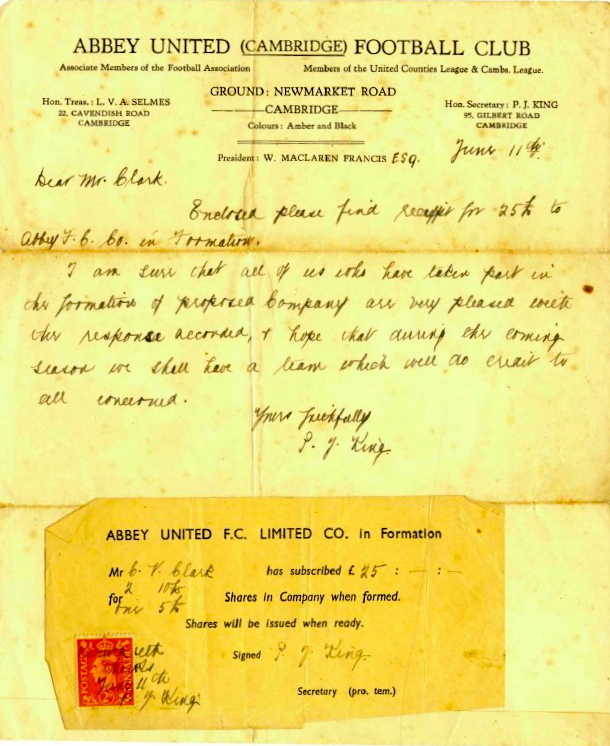 Letter from Hon Secretary PJ King to a Mr Clark acknowledging receipt of £25 for shares in Abbey United FC Limited, to be issued when the company was formed.